We often hear from people who tell us they would never want to take a cruise because they think they’d get bored. 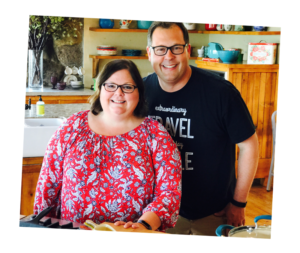 Somehow, the thought of a day at sea takes them back to their childhood, stuck in the middle of the backseat of their parents’ car for the entire eight-hour trip to Aunt Lavern’s house. We’ve learned firsthand that there is nothing boring about cruising. We think of cruise ships as floating resorts that give you a new view every day. They have so many things to do we can almost guarantee you’ll find yourself wishing you had more time on board to take it all in. And, we’re not just talking about the food. We’ve taken five cruises so far, all with Celebrity, and not only have we never been bored, we’ve never had enough time to do everything we’ve wanted. Trivia contests happen several times a day and cover a variety of themes including general knowledge, music, sports, and more. Plus, there are always prizes for the winners. In addition, they only take about 20-25 minutes, so they aren’t an all-day commitment. 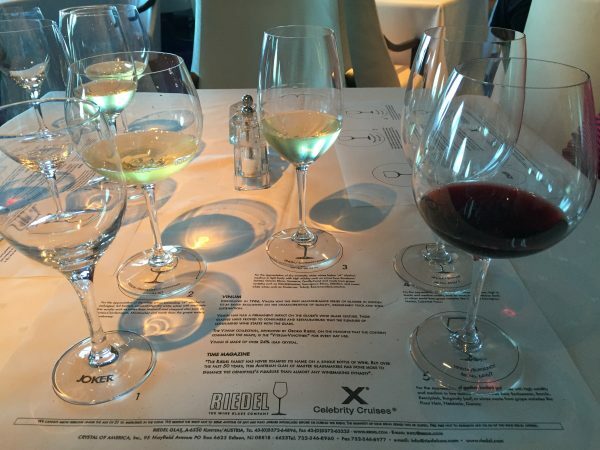 We have taken several classes on wine while cruising, including everything from how to pair wine with food to why it is important to serve wine in the correct glass. We’ve also been to wine tastings and sampled some of the finest reds and whites available in the world. We really enjoyed the Riedel wine glass workshop onboard a Celebrity Cruise a few years ago. Nothing says vacation quite like a massage, facial, or pedicure. Treat yourself. For special deals, visit the spa on port days. How many times have you thought to yourself that you’d finish that book if you just had some time? Cruising is a great way to unplug from the world, and a couple hours reading on the veranda is a wonderful way to unwind. 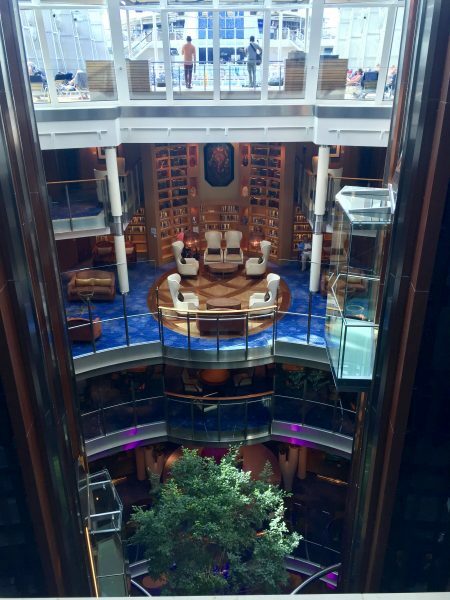 If you didn’t bring a book, check out the ship’s library and borrow one. Speaking of slowing down, another thought is to grab a cup of specialty coffee (or maybe a cocktail) and go sit and watch the waves go by. One of my favorite pastimes on board is to head to the lounge at the front of the ship and simply sit and watch the scenery. Some of the most beautiful scenery in the world is found in the Stockholm Archipelago, as you can see in the video below. Ships are huge machines, and there is a lot going on behind the scenes to make things work. You can take a galley tour and see just how they prepare a gourmet dinner for 2,000 every night. Other tours might visit the navigational bridge, crew areas, and engine control rooms. You’ll learn so much about how they make all the magic happen. There are so many interesting things to explore on the ship. I put this on the list hoping Ann doesn’t have any photos of me learning the dance to Michael Jackson’s “Thriller.” In any event, there are classes for everything from classic ballroom dancing to swing dancing, and so much more. If you like to trip the light fantastic, this one’s for you. If you have two left feet, don’t worry. This is your chance to let down your guard. Remember, you’ll probably never see these people again. We have not been on a cruise where we didn’t see a group of people happily playing a game of cards. If you’re a bit more adventurous and want to try your luck, the ship offers card games in the casino, as well. One of our favorite on board activities of all time was a mixology class we took at the World Class Bar on the Celebrity Eclipse. We learned about the history of classic cocktails and the technique of making them. We even got to go behind the bar and try our hand at mixing a drink. I now understand why a Japanese jigger is better than a traditional one, and how an orange peel and a little flame can add a whole lot of flavor. On Celebrity’s Solstice class ships, they perform demonstrations of glass blowing. It’s pretty neat to watch a blob of glowing orange gunk become a work of art right before your eyes. We’d never see that in Crete, America. There are also a variety of lectures on board, including talks about the ports of call, art history, and the engineering of the ship. 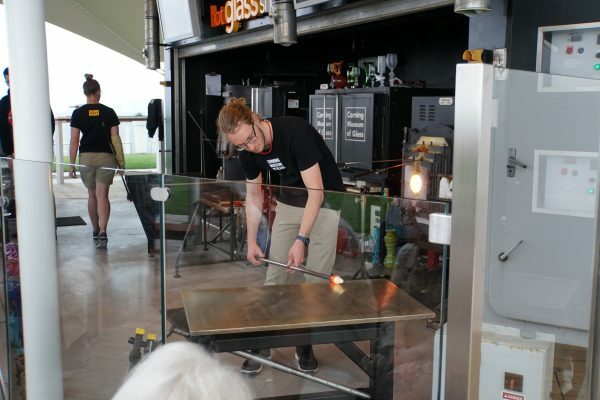 We enjoyed watching this glass blowing demonstration last summer at sea. Do you like watching cooking shows on TV? 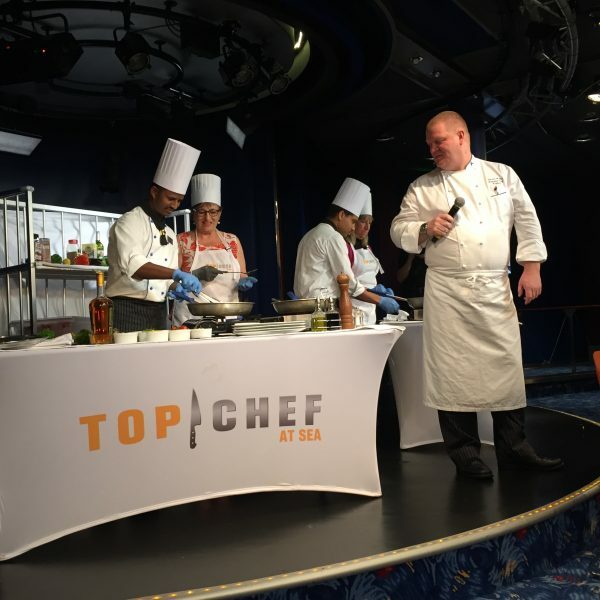 Have you seen Bravo’s “Top Chef?” Cooking competitions pair a volunteer contestant passenger with an experienced ship chef. It’s fun to watch, and would be a blast to participate. There area also game shows like Family Feud and The Newlywed Game that are always looking looking for volunteer participants. Don’t be shy! Audience participants are teamed with professional chefs in this onboard game show. 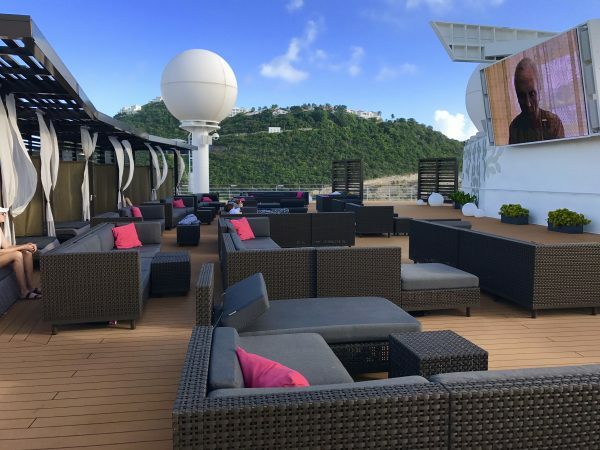 Many ships have huge screens on the pool deck that show movies throughout the day. Others show them in theaters. Either way, it’s a fun way to pass some time and catch that flick you’ve wanted to see without having to pay the high cost of a movie theater ticket you would back home. Most cruise ships have either indoor or outdoor (or both) screens for watching movies onboard. We’ve met so many interesting people while cruising. Whether at dinner or at one of the bars, there are always wonderful people around who are willing to visit. We’ve always enjoyed meeting new people and hearing about their travel adventures. Who knows? Maybe you’ll make a life-long friend. We’ve met so many nice people on cruise ships including this couple from Chicago. Believe it or not, ships host an entire mall of duty-free shops. Whether you are in the market for high-quality spirits, jewelry or cosmetics, the ship probably has it and they will price match what you can get in port. There are actually some good deals on board. What’s more, you can use any onboard credit you might have to make those purchases! Ships are huge, often 1000 feet or more long, and well over a hundred feet wide. In addition to a walking track designed for those who want to get exercise, there are plenty of outdoor and indoor spaces for you to explore. Meander around and see what you can find. On Celebrity’s Solstice class ships, you can even take a stroll on a lawn with real grass. 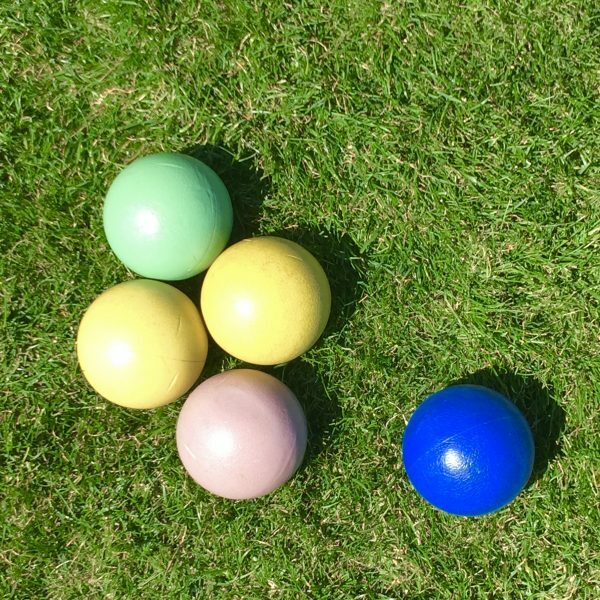 Just watch out for people enjoying a game of bocci ball. We love being able to walk not only on a walking track, but also on the lawn. 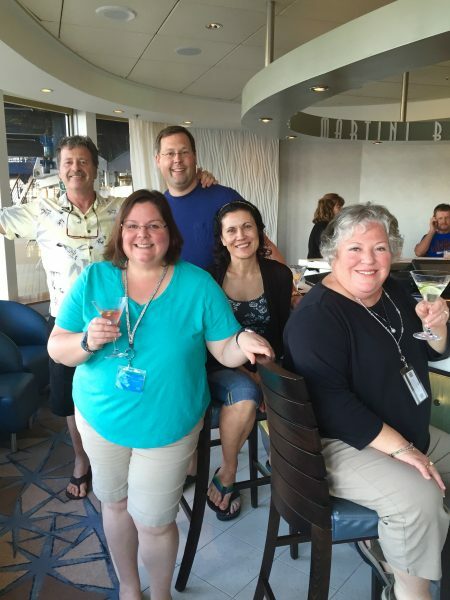 Cruises are a great opportunity to really connect with friends and family with whom you’re vacationing. No cell phone coverage and limited internet access make it really easy to put aside distractions that we all have on land and really talk to face-to-face to one another. Cherish those moments. Meghan and Steve relax and visit in the lounge. 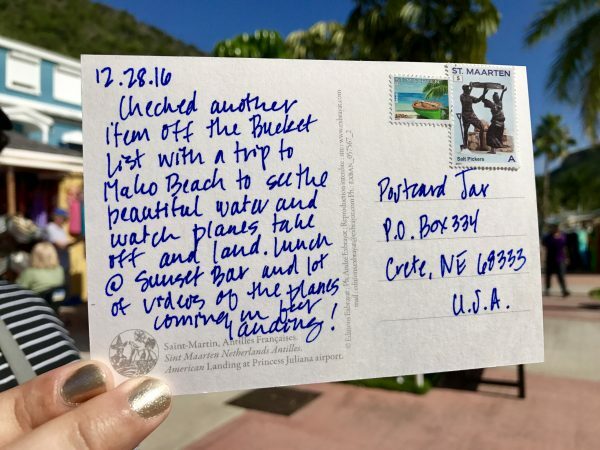 We usually dedicate some time on sea days to write postcards to send home to loved ones and to our Postcard Jar. We’ve also taken time to write a note to crew members who have gone above and beyond to make our cruise special. They put in a lot of work and those notes mean a lot to them. 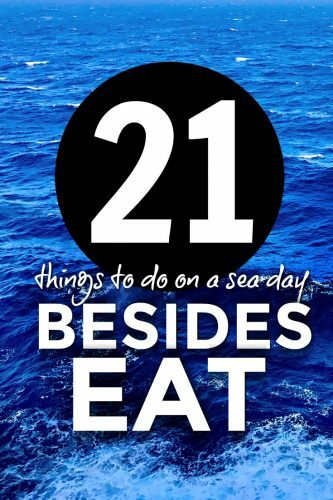 We often use sea days to write out postcards to our jar back home or to friends and family. From slot and blackjack tournaments in the casino, to pool volleyball and ping-pong tournaments on the lido deck, there are competitions all over the ship. Take an hour, and join in the fun! This one is pretty obvious. Ships have multiple pools, including indoor pools, so you can always take a dip even on that early-season cruise to Alaska. 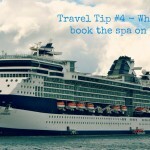 There are also hot tubs galore on board and plenty of deck chairs to use to soak up the sun. Sometimes, the most enjoyable thing to do on a sea day is simply enjoy the view. We’ve watched sunrises and sunsets, listened to glaciers calving, admired the mountains in the distance, and waved at townspeople below when we’ve left port. 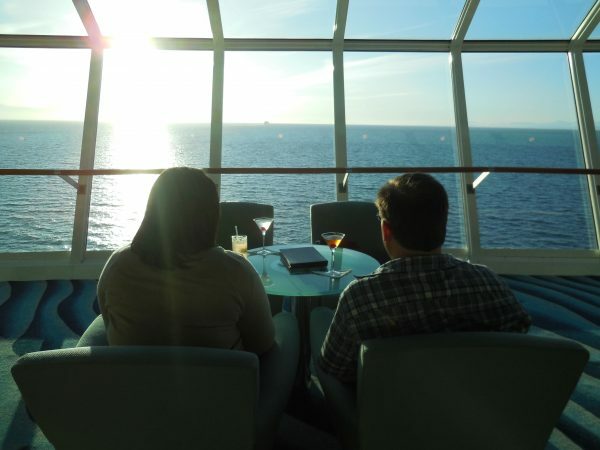 There is nothing like the view from a cruise ship, and we never miss the opportunity to take in one more look. 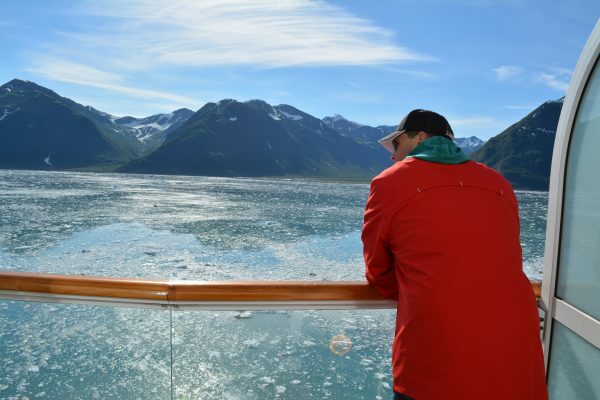 Enjoying the view from our veranda while cruising in Alaska. This is by no means a complete list. On board, you’ll find “Celebrity Today,” a daily newsletter published that shares useful information as well as a list of the dozens of different activities offered every day. If even five or six items on this list piqued your interest, you’d have a pretty full day. Our guess is that by the end of the cruise you’ll find yourself wishing for more time at sea. Which of these things do you want to try? Is your favorite activity on this list? Let us know in the comments section below! Thanks for sharing (and pinning) this post! Lol I could relate to learning Thriller. My husband took a video that I insisted he delete… I was, let’s say, less than graceful 🙂 Anyway, this post made me yearn to be back at sea… fortunately that will happen in another nine days 🙂 Great post! How exciting! To where will you be cruising? You forgot join the choir on trips of fourteen days or more some times the show people organisé a choir and we perform on the last day at sea! You know, that is something to do. We’ve only take one 14-night cruise and now that you mention it, there was a choir. We had thought about participating, but then got distracted (by the many other things to do) and missed rehearsal. But we did think that was something to try in the future! Haha, I learnt the Thriller dance on a cruise and my husband said I looked like a weird kangaroo! LOL! For what it’s worth, I felt like a weird kangaroo when I did that dance!